ISLAMABAD: Parts of Punjab, Khyber Pakhtunkhwa along with Murree, Kashmir and Gilliat received rain (with snowfall over the hills) early on Monday, decreasing the temperatures further. 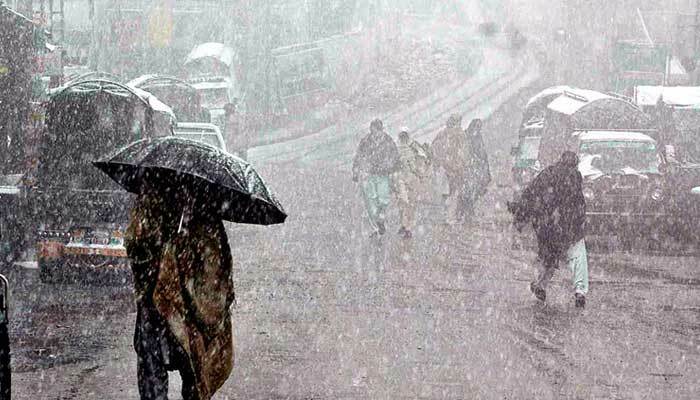 According to details, Murree and upper parts of Kashmir are observing intermittent snowfall, turning weather cold. The tourists are ready to enjoy in chilly weather. While the rain started on Sunday night and continued till Monday morning in several parts of Punjab and Khyber Pakhtunkhwa, including Malakand, Hazara, Peshawar, Kohat, Rawalpindi, Lahore, Sargodha, Faisalabad divisions, FATA, Islamabad, Gilgit-Baltistan and Kashmir. The rain turned the weather cold and rainwater inundated at scattered places of upper parts besides few central areas of Punjab. Police and rescue agencies advised people to stay home unless absolutely necessary. According to the Pakistan Met Office, a westerly wave, which has approached western Pakistan on Sunday night, may continue to grip upper and central parts of the country for next few days. Under the influence of this weather system, rain (with snowfall over the hills) has been forecast in Malakand, Hazara, Mardan, Peshawar, Kohat, Rawalpindi, Gujranwala, Lahore, Faisalabad, Sargodha, D.G. Khan, Quetta and Zhob divisions, besides Islamabad, Gilgit-Baltistan and Kashmir, while the same weather has been forecast for isolated places in Bannu, Dera Ismail Khan, Multan, Sahiwal, Bahawalpur, Sukkur, Karachi and Makran divisions from Sunday evening till Tuesday.